Spectacular Panoramic Water and Golf Views from all 3 Floors!!! One of the highest points in Reunion! This is a must see Fully Furnished home with an Elevator! 1st floor: kitchen, dining room, living room, laundry closet, bedroom with bath, covered patio. The kitchen features: tall upgraded cabinets with lighting underneath, granite countertops, gas range, bar, butlerâs pantry, and breakfast nook. 2nd floor: 3 bedrooms + 3 bathrooms + 2 balconies which includes the master bedroom. The master bedroom has a sitting area, a walk out covered balcony, and built out organized closet. 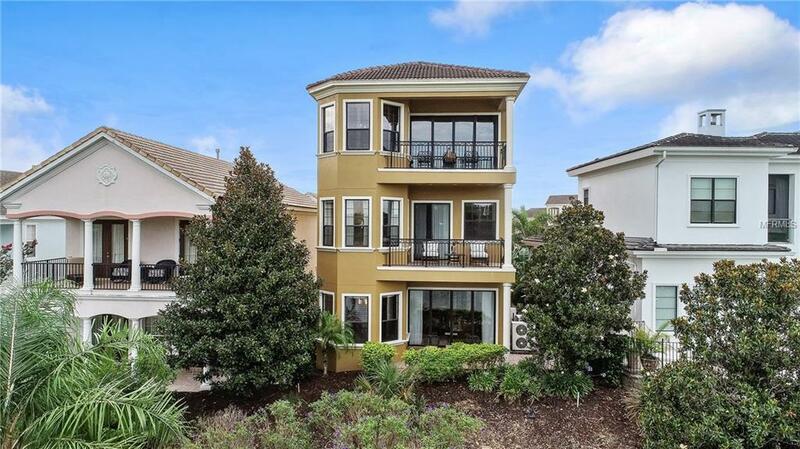 3rd floor: balcony, half bath, theater room, game room with card table + pool table + wet bar + mini fridge. Apartment over the garage features: 2 bedrooms with upgraded bathroom, balcony overlooking pool, mini fridge, microwave, cabinets and sink. Pool features: heated pool + spa, half bath, grill, cabinets, and sound. The house is loaded with upgrades: the upgraded bathrooms have decorative tile + granite + framed mirrors. The high end AC Chiller system that has recently been serviced. Throughout the house: tall ceiling heights, solid core 8ft doors, surround sound, crown molding + tall baseboard, plantation shutters, upgraded ceiling fans + lighting, so many balconies, built in closets organizers, tankless water heaters, and exterior of the home has been recently painted + windows sealed. Reunion is perfectly located to Central FL attractions with easy access to I4 and State Rd 429. Reunion features: an interactive multi-level water park, tennis complex, dining, spa, guard gated patrolling security, and 3 Signature Golf Course designed by Jack Nicklaus, Arnold Palmer, and Tom Watson. Additional Water Information: Spectacular views of water and golf! Pet Restrictions: See HOA rules and regulations for pets.